The LD enclosure is a 316 stainless steel housing for your Balluf BVS or Cognex IS7000 camera. Designed to work in highly corrosive environments, it also is designed to work in food applications, with care taken to reduce pockets where water might sit. 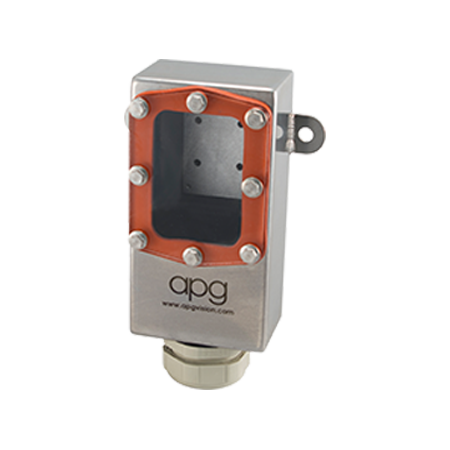 The standard cable gland at the bottom of the enclosure uses a split insert to provide a watertight seal around one or more cables. The gland allows passage of the standard I/O and power cable (and the Ethernet cable) without removal of the connectors from the cables. Enclosure meets NEMA 4X standards when equipped with single cable cord grips.